King Lear, Title Page of First Quarto Edition, published by Nathaniel Butter, 1608. 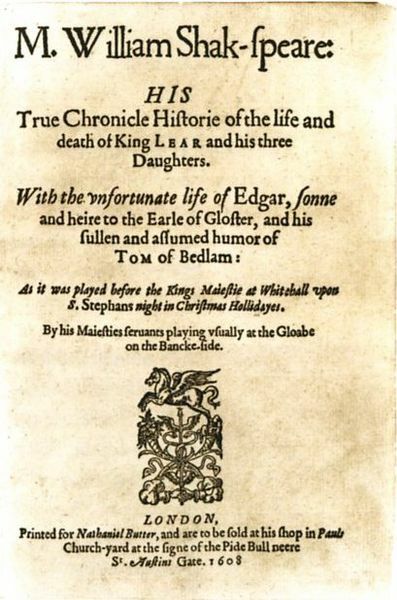 The title page of the first printed edition of Shakespeare's King Lear tells us soemthing about what was thought to be most important or attractive about the work. The page states that this is a "true history" and also gives prominent place to Edgar and his disguise as "Tom O'Bedlam." King Lear is a highly problematic historical text, for two different editions published about 10 years apart differ in significant ways: each includes lines that do not exist in the other, the two versions each employ different methods of punctuation, each contain different line breaks as well as indications of verse and prose. The most common version of Lear read, however, is a conflation of the two texts, perhaps implying that Shakespeare wrote a single, now lost version and that both versions that come down to us are imperfect parts of a former whole.